Let’s admit it, using an Apple is both a reward as well as stupidity. It’s amazing to have a Mac device with all the elegance, performance and premium looks but when it comes to extended functionalities, Apple fails miserably. With such a limited ecosystem and freedom to access everything, many Mac users suffer. For instance, you can’t download music or videos independently. There might be a day when Apple would decide to provide an application to download videos, but currently, they are not fulfilling anyone’s wishes. That’s why other companies have entered the market to satisfy the purposes for which Mac users crave for. Today, I am here with the review of a fantastic application that’ll make any Mac device user go gaga and that tool is Downie. 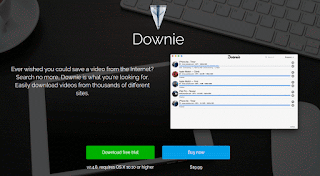 So without any further talking, let’s start the review of Downie, a Mac application that allows downloading videos from any website including YouTube. Pretty Great! Isn’t It? For everyone out there using a Mac, always craving to download or save videos from YouTube, Dailymotion, Vimeo and so on, you’ll be finally able to. The application is Downie, and it would let you download videos from any most of streaming video websites. Any great Mac app would include a considerable balance of accessibility and functionality. In other words, the app must be easy to use and understand, should consist organized features, and most importantly should complete the task within few clicks. So, let’s get see whether Downie would be able to satisfy all the requirements or not. To get started with the installation, you’ll need to download the setup first. Although Downie is a premium tool, the app developer, fortunately, offers a trial version for you to test out all the essential features. You can download the trial free from the official website. The app requires OS X 10.9 or more. Also, note that this app is not is available on the App Store. Download downloading videos from YouTube or any other website? Well, all you need to do is to drag the link to the video source from any browser like Safari into the Downie’s Window. You can also copy and paste the link and just let Downie do all the work for you. Downie can be easily integrated with iTunes. So, if you only need to download audio tracks and not the audio. No worries, Downie would do the job for you. Moreover, it also provides relatable websites or online platform from where you can download the video easily. The process is very fast and straightforward. You can easily monitor the progress, and it also lets you save in the destination folder of your choice. No Compromise with the Quality- One of the most unusual features in the premium version is that you can download and save 4K resolution videos from YouTube. Yep, that’s right. 4K! You can also download videos in standard HD or mp4 format as it all depends on your Internet Speed and demand for quality. With the latest updates, you can now download even ZIP or compressed files and that too from non-video websites. The tool supports over 1100 sites and provides regular updates. So, you’ll get more help of website by every upgrade. Downie hosts international users and provides country-specific sites too. Moreover, if you’re suffering from any error or issue regarding the support or downloading process, you can contact the developer via mail for resolving the issue within 24 hours or so. Packing so many incredible features and functionalities, how much does this application cost? Well, this fantastic video downloader is available for a price of $20 and trust me you won’t find any other relevant app in such price range. Downie offers video downloads from hundreds of video streaming websites like YouTube, Vimeo, etc. Moreover, you can always download the free trial to try out all the features that this app offers. Pause and Resume downloads, automatically save from unlimited resources, download videos in 4K and much more. Downie is truly a fantastic application for all the Mac users who are tired of streaming videos online. 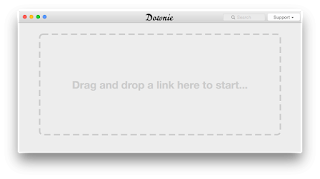 It is now the time to stop searching for download tutorials for Mac and start using Downie. This was my take on Downie and trust me on this, when you’ll download the first video on your MacBook Pro or iMac, no such other thing would make you happier at that moment. So, do let your thoughts below on this beautiful application. Cheers! Previous articleMailButler Review: Is It The Best Personal Assistant for Emailing?